KIM LAWTON (@KimLawtonRandE), correspondent: The Theological School of Halki was once the world’s leading Eastern Orthodox seminary. But it was closed by the Turkish government in 1971. More than 43 years later, the US government and many faith-based activists around the world are still waging a campaign to see it reopened. KATRINA LANTOS SWETT (US Commission on International Religious Freedom): Halki is important substantively, of course, to the Orthodox community, but it is also very important symbolically to the world and to those concerned with religious freedom. 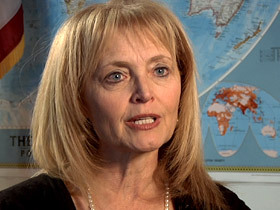 LAWTON: Katrina Lantos Swett is chair of the US Commission on International Religious Freedom. LANTOS SWETT: This is perhaps the most obvious symbol of sort of false promises, broken faith on the part of the Turkish government when it comes to issues of religious freedom. We are very much in the posture of encouraging Turkey to step up and do the right thing and it would strengthen, not undermine, Turkish society. LAWTON: Halki is on an island about an hour’s ferry ride from Istanbul. From the dock, visitors take a horse drawn taxi to the top of the Hill of Hope, where the school was established in 1844, on the site of a Byzantine-era monastery. It quickly became a major international institution of higher education, with a library that boasted more than 110,000 volumes. Ecumenical Patriarch Bartholomew, spiritual leader of the world’s more than 300 million Eastern Orthodox Christians was a Halki graduate, as were many of the top Orthodox leaders in the US. Orthodox officials say Halki’s closure has had a profound impact on their church. METROPOLITAN ELPIDOPHOROS (Bishop of Bursa): We were deprived of our right, of our ability to renew our clergy. It was a very big loss for us. And this lasts already 43 years. It’s a long time. LAWTON: Metropolitan Elpidophoros was born in Turkey, but as a young man feeling called to study theology, he says he had no choice but to do so somewhere else. He studied in Greece. METROPOLITAN ELPIDOPHOROS: When I finished my doctorate studies and I was elevated to professor, again, I had to go to another country to be a professor because in my own country, my own school, my own monastery is closed? I cannot do that. And I’m a citizen of this country. LAWTON: Halki was shuttered during a time of strong pro-Turkish nationalism. Because of longstanding tensions between Turkey and its neighbor Greece, all entities perceived as having ties to the Orthodox Church or Greece suffered severe restrictions. Those sentiments linger in many quarters. Turkish officials have long said the school will not reopen until Greece improves the situation for Turkish minorities living there. METROPOLITAN ELPIDOPHOROS: Greece had to do some steps to give some rights to the Turkish population in Greece. And then we asked ourselves, why we are hostages from our own country for some possible difficulties that some other citizens of another have? LAWTON: Turkish government officials declined our request for an interview. Fatih Ceran of the independent Journalists and Writers Foundation in Istanbul admits there seems to be little internal political will to see Halki reopened. 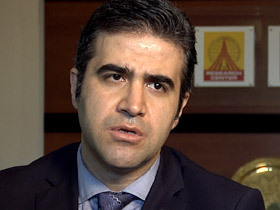 FATIH CERAN (Journalists and Writers Foundation): The issue has been politicized to a serous degree. 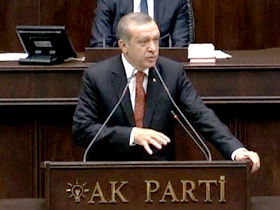 It has been a subject to bargain between the Turkish and Greek governments for example, you know, reciprocity. I personally believe the rights of my country should not be a subject of bargain in international debate. It should be granted. LAWTON: The Greek Orthodox community inside Turkey has diminished dramatically in recent years. Official statistics suggest there may be fewer than 5,000. They are allowed to worship. But Metropolitan Elpidophoros says true religious liberty is more than that. METROPOLITAN ELPIDOPHOROS: The problem is to allow me to educate myself, to educate my children, to educate my family in a Christian way, to teach them our religion. To be able to educate the candidates for priesthood, and if this is not secured by my country, then my country violates my rights. LAWTON: Halki’s ongoing closure is all the more poignant for Turkish Christians because of the history surrounding them. For centuries, Istanbul, formerly Constantinople, was the center of ancient Christianity. But those glory days are long gone. 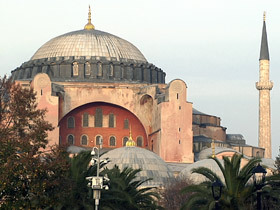 The magnificent Hagia Sophia, once the most important cathedral in Christendom, is now a museum. And there are persistent rumors that it may be turned into a mosque, as it was after the Ottomans conquered the Byzantine Empire. METROPOLITAN ELPIDOPHOROS: There are monuments that when I visit them, arise in me some deeper feelings of pain and also of prayer to God that may heal the wounds of the past. LAWTON: In the face of strong international criticism, Turkey’s powerful former prime minister, now president Recep Tayyip Erdogan has indicated--including in meetings with President Obama—that Halki could open again. But he has not followed through, and the school remains closed. METROPOLITAN ELPIDOPHOROS: Erdogan gave us back many rights that we were deprived of. He corrected many mistakes of the past. But still, there are so many problems So if such a powerful president feels unable to open this school, then who can do that? LANTOS SWETT: You wonder to what degree pressures from Islamist forces from within Turkey are prevailing upon the government not to follow through on commitments that they have made openly if not publicly. So I think that’s a concern. Because if that is the case, that they are responding to those sorts of pressures, that’s not a good omen. LAWTON: After decades of waiting, three years ago, Ecumenical Patriarch Bartholomew appointed Metropolitan Elpidophoros abbot of Halki and tasked him with re-establishing a monastery and making it a living community once again. METROPOLITAN ELPIDOPHOROS: We realized that we waited for a long time, and now, it’s a time for action, not to wait anymore. We lost 43 years waiting. LAWTON: Nine monks now live on the grounds, overseeing a small farm and a garden where they are trying to cultivate all 88 plants mentioned in the Old Testament. Restoration of the buildings is underway, the library has been catalogued and they have begun the mammoth job of digitizing all 110,000 books. METROPOLITAN ELPIDOPHOROS: We are confident that someday this school will reopen. And we have to prepare ourselves for this day. 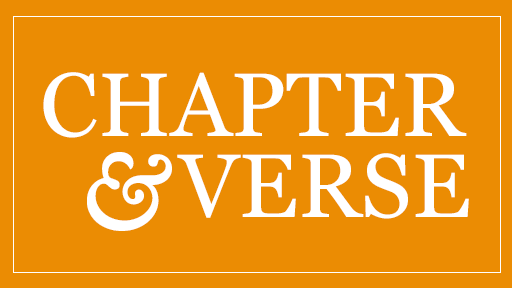 LAWTON: Despite no signs of that happening anytime soon, the metropolitan says they still are moving forward in hope, a key tenet of their Christian faith. I’m Kim Lawton at Halki Seminary in Turkey. Once the world’s leading Eastern Orthodox seminary, Halki was closed by the Turkish government 43 years ago. The US and religious freedom activists want it reopened. But Turkish officials have long said that won’t happen until Greece improves conditions for Turkish minorities living there.